This drawing was done for our second annual Sacred Art Show, which fell on the feast of St. Joseph that year. Each artist was invited to contribute a piece dedicated to him for a special display in the show. I immediately conceived this image in my head as a simple representation of St. Joseph’s role in Jesus’ life. Just as any father does, St. Joseph gently trains his son, imparting to him the wisdom, knowledge and skills he will need in life. 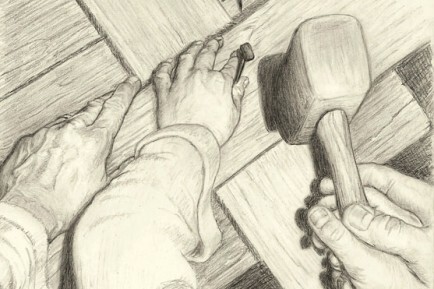 They fashion the wood into a cross using three nails, symbolic of Jesus’ passion and death.